EDIT Oh hi new page. @RyanDS I have 8 and I find it really doesn't carry over well on the vita is 9 any better? Are there any traditional top-down RPGs on the Vita? Would love one. Oh, not that kind of top down. I think there's a Kickstarter game that's inspired by Zelda that will probably come to the Vita. Dragon Fantasy book 1 will meet your needs. Skullgirls Encore has been announced for Vita. I played the first 30 minutes of Ratchet & Clank Trilogy last night and was very impressed. The graphics look nice and the game runs well. There did seem to be some very slight input lag however but it seems consistent so it seems a case of just hitting jump a fraction of a second before you need to jump as others have said. The camera isn't the best if you cant see in 3D and prefer it to point downwards when jumping to better see the jump (this may be improved in 2 and 3 though) but you can use your thumb on the right stick to hold the camera downwards for jumps, which is fine. I'm not sure whether I would recommend it yet as I'll have to play more but first impressions seem good considering the trilogy cost £18. I thought it did, and much prefer it to 8. There are a few good PSOne RPGs I would recomend. Maybe Grandia as well? Think all the PS1 FF games play well on Vita, especially 9 though but that could be because it was the latest, therefore most "advanced" so to speak. Grandia also is excellent on Vita. Rouge Legacy confirmed for the 30th of July on Vita PS4/3 cross buy and save. @MothFlesh I wasn't going to buy any games next month (supposed to be the case this month but it went utterly to pot)... But it's going to take some real self control not to jump on that day one. Adam Boyes (the guy who signs third party games?) replied with "Wowowow!" I have something like half a dozen retail games at this stage. Digital content FTW! You've got more boxed Vita games than pretty much any games shop I've ever been to. Do you mean Hyper Light Drifter? that's definitely heading to Vita. You can buy Vita games at retail?! @aros what do yuo win? a 64gig memory card so you dont need to waste your time with carts anymore? I have a 64gb card but love having a proper collection The box, the cart, the art work. 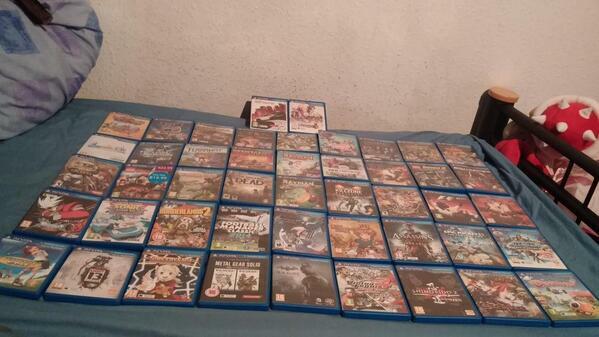 I do have a lot of digital games that I would rather have physical versions of though sadly. 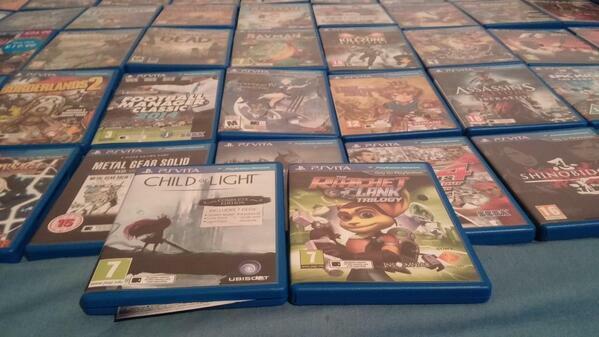 Aiming to have more Vita games than SNES games soon. Very Impressive! I was pleased with my dozen or so retail games, but you've got me beaten many times over! Are they only selling the new version of Vita now? Been checking online shops and the prices seem rather steep. I ordered Ratchet and clank triology and rayman legends today. Well you've certainly got my paltry 17 boxed games beat. How many do you have! ?